Cells are the most basic unit of life. Without them the living world does not exist. A thorough understanding of the cell is one of the basic rites of passage for any biology student. Honors biology has spent the past couple of weeks checking out cells and all of their inner workings. I have, admittedly, been a little slow in getting student posts updated. So, this week in review by Mohammad Chenchar is a bit late, but still totally relevant. This week we learned about cell discoveries and the cell cycle. Cell history:While the invention of the telescope made the Cosmos accessible to human observation, the microscope opened up smaller worlds, showing what living forms were composed of. The cell was first discovered and named by Robert Hooke in 1665. He remarked that it looked strangely similar to cells or small rooms which monks inhabited, thus deriving the name. However what Hooke actually saw was the dead cell walls of plant cells as it appeared under the microscope. 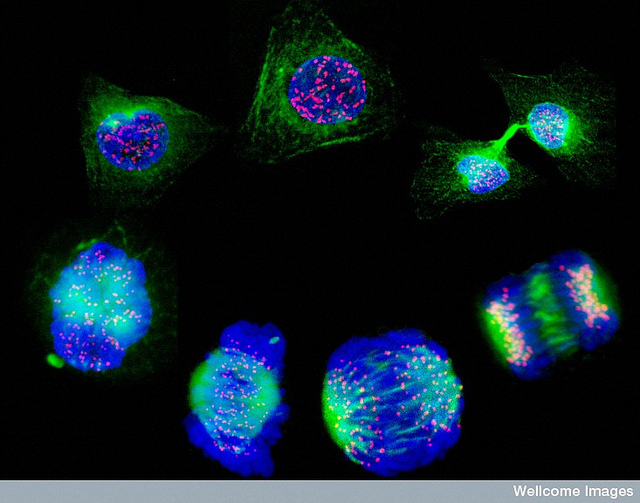 The cell walls observed by Hooke gave no indication of the nucleus and other organelles found in most living cells. The first man to witness alive cell under a microscope was Anton van Leeuwenhoek, who in 1674 described the algae Spirogyra.Van Leeuwenhoek probably also saw bacteria. Cell division:Cell division is the process by which a parent cell divides into two or more daughter cells.Cell division is usually a small segment of a larger cell cycle. This type of cell division in eukaryotes is known as mitosis, and leaves the daughter cell capable of dividing again. The corresponding sort of cell division in prokaryotes is known as binary fission. In another type of cell division present only in eukaryotes, called meiosis, a cell is permanently transformed into a gamete and may not divide againuntil fertilization. Right before the parent cell splits, it undergoes DNA replication.